Center of gravity is the average location of the weight of an object, or in other words the balance point or point of rotation when an object is allowed to freely rotate. 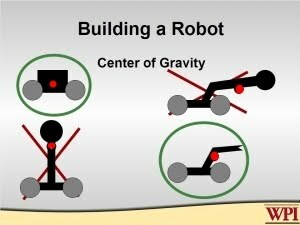 This concept is very important when designing your robot in two areas, stability and traction. Stability is essential to your robot. At some point in a robot operator's driving career, she/he will experience the terrible situation of having to stand around for the rest of a match because their robot is over on its side and can not pick itself up. Every object will fall to its most stable configuration as soon as the center of gravity passes outside its base of support. You may have balance a yard/meter stick upright on the palm of your hand, in order to do this you need to make adjustments by moving your hand to keep the stick's center of gravity over the narrow end of the stick. If you lay the stick lengthwise, but on the narrow edge, it is more stable, but a small change in angle from the side will move the center of gravity outside the base and it will tip over. If the stick put on its flat side, this is the most stable condition and it actually has to be lifted in any direction in order to move the center of gravity outside its base. The good people at Worcester Polytechnic Institute developed some nice diagrams to illustrate this principle with robots as part of their EBOT training workshop (historical note: the EBOT was the 1st generation VEX design system). 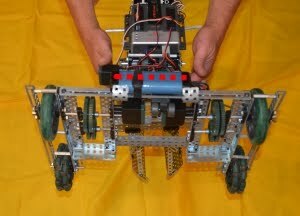 Robot one (top left) is a stable robot with its center of gravity located low and equally between the wheels. Robot two (top right) is very unstable and is in the process of falling over because its center of gravity is outside of its support base. 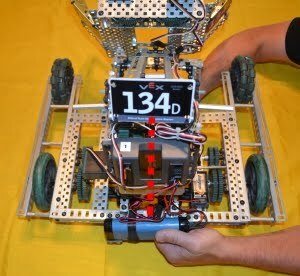 Robot three (lower left) is not stable because the center of gravity is high and if any of its wheels are lifted, it will not take much for the center of gravity to move outside the support base. Robot four is fairly stable because the center of gravity is low and between the tires, although it should be noted that if this robot were to pick up a game piece, it could easily move the center of gravity and make it unstable. It is important to understand that the support base is determined by drawing lines between the points of contact with the ground and NOT the robot frame. 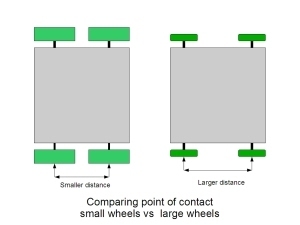 For instance a, robot with larger wheels inside the same frame will have less stability than one with smaller wheels, because the points of contact (contact points of the wheels) can be further apart with small wheels. 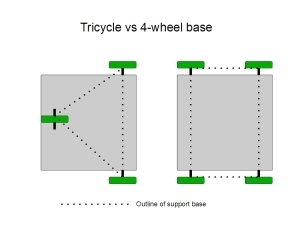 By the same reasoning a tricycle drive base will not be as stable as a square drive base. Traction is what will allow your robot to move. It is the force applied to the contact surface times the coefficient of friction of the contact surface. Since you can not change the friction of the VEX wheels or the playing surface, the only option left is to change the force. This force is the robot's weight. The center of gravity location determines how much weight is applied to each wheel/support point. This being said, our earlier consideration of stability still is in effect, the closer the center of gravity is to edge of the support base and/or the higher the center of gravity is the more unstable your robot. 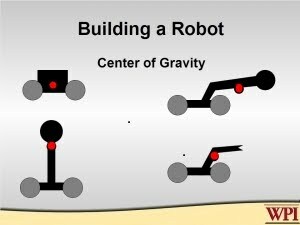 Determining the center of gravity of your robot – There are a number of ways to determine where the center of gravity of your robot is located. If you are using Computer Assisted Design software most packages have a show center of gravity function. The easiest, but rough, way to determine your robot's center of gravity is to hold it with one hand on each side until the robot balances. Draw an imaginary line between hands. Now grasp the robot on 2 different opposing sides (the second axis) and find its balance point – draw an imaginary line between the points. Repeat a third time in the last orientation, the point the intersecting lines connect is your robot's center of gravity. The ideal would be having a center of gravity below your robot's wheel axles and situated in a place to put the majority of weight equally distributed on the drive wheels. In reality, most designs are fortunate to have equal weight on each drive wheel and keep the center of gravity over the support base. The placement of non-structural components (battery, backup battery, motors, gears, control system, pneumatic storage cylinders) can be placed to change the center of gravity. In addition, as a “fix” to an unstable design, outriggers can be added to the a base, but this can not be done if it makes the starting position of your robot larger than rules state for the competition.